Whether it’s from dizziness, medication side effects, certain health conditions like arrhythmias or just tripping over an uneven surface, the fact is the older we get the more likely we are to fall. For some seniors, it’s a serious and recurring problem. How can you best prevent falls in the elderly? In the bathroom: Put a non-slip rubber mat or self-stick strips on the floor of the tub or shower. 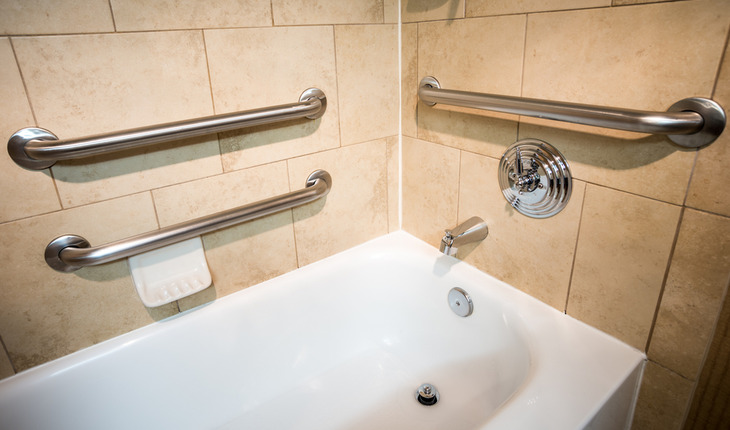 Install a grab bar inside the tub and next to the toilet. Consider installing a floor level shower that doesn’t require climbing or stepping into it. Check the floors: Move the furniture in walkways and hallways so the path is clear. Remove rugs or use double-sided tape or a non-slip backing so the rugs won’t slip. Pickup any loose objects like papers, books, towels, shoes, magazines, boxes and blankets. Tape or clip wires and cords to the wall. Check stairs and steps: Always keep objects off the stairs. Fix loose or uneven steps. Make sure the carpet is firmly attached to every step, or remove the carpet and attach non-slip rubber treads to the stairs. Have an electrician put in an overhead light at the top and bottom of the stairs. Make sure handrails are tightly secured to the walls. In the kitchen: Move more frequently used items like cups and dishes to the lower shelves of cabinets. If you must use a step stool to reach items that are stored higher up, get one with a bar to hold on to. Never use a chair. Make sure all kitchen chairs are even and don’t wobble back and forth. In the bedroom: Place a lamp close to the bed where it’s easy to reach. Put in a nightlight so you can see where you are walking at night. Consider carpeting which can absorb the impact of a fall better than tile. Check medications: Ask your pharmacist to review medications you take as some can make you sleepy, dizzy and more prone to falls. Wear shoes as much as possible: Make sure and wear shoes inside and outside the house. Sneakers with a firm rubber bottom that grips the ground well are best. Avoid going barefoot or wearing slippers or socks. Easy access to help: Keep emergency phone numbers in large print and near each phone. Put a phone near the floor in case of a fall and you can’t get up. Think about wearing an alarm device that with the click of a button will bring help if you’ve fallen and can’t get up. Vision checks: Get regular vision checkups at least once a year. Poor eyesight can contribute to falls. Regular exercise: Exercise makes you stronger and improves balance and coordination. Regular exercise may help reduce falls or the injuries from falls. Always check with your physician before starting an exercise program. Protective clothing: Hip protectors, knee pads, elbow pads, wrist splints and soft foam helmets can greatly reduce or eliminate serious injuries in people who fall often. Nutritional changes: Speak with your doctor about adding calcium, vitamin D and C. These may help prevent fractures and reduce falls according to several studies. Kurt Kazanowski MS, RN, CHE, a hospice, homecare and senior care expert, is the author of A Son’s Journey: Taking Care of Mom and Dad.